Crude oil production continued to be negative, as it has been for a long time. The output of petroleum refinery products was up 4.9% y-o-y, but that’s only because in November 2008 it fell by 1.1%. Electricity generation rose just 1.8% y-o-y, despite going up by a mere 2.6% y-o-y in November 2008. While finished steel production increased very strongly by 11.7%, that’s entirely because steel production contracted by 6.3% in November 2008. As a matter of fact, finished steel production in November this year was well below the level reached in May. The only big increase came from the cement sector, where production increased by 9% on top of the November 2008 growth of 8.7%. In short, the 5.3% growth in the core sector, which has a combined weight of 26.7% in the Index of Industrial Production (IIP), need not necessarily point to a rebound in the IIP for November, once the base effect is taken out of the picture. 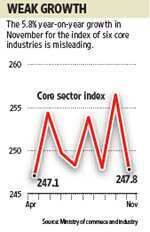 Taking the month-on-month figures instead, the numbers show that core sector performance has been quite muted.